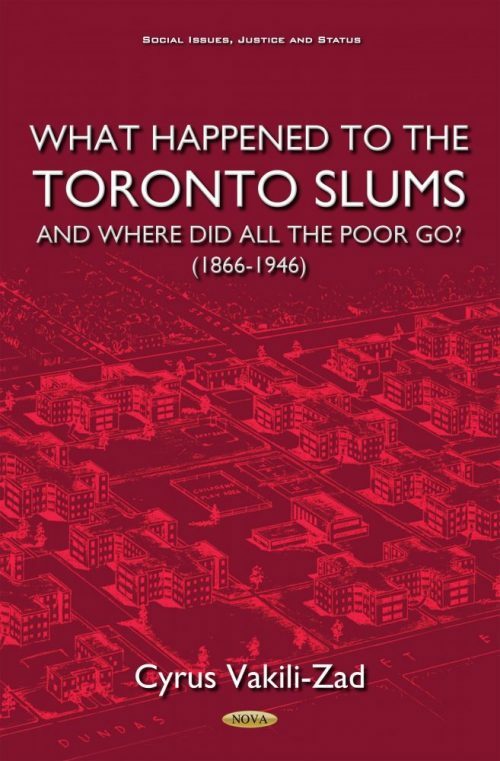 By the late 19th century and the early 20th century, there were at least nineteen large and small areas, streets or neighbourhoods that were declared or labelled slums in Toronto. By the 1960s, almost all the slums had been cleared and were replaced by institutional, governmental and residential modern buildings. However, the foot prints of these slums, their boundaries and characteristics of their residents had been lost. This book intends to trace the development of these slums and outline their lifecycles. Although the book deals with all major Toronto slums, the emphasis focuses on Regent Park, which replaced the largest Anglo-Saxon slum in North America named Cabbagetown. Regent Park was also the first large housing project that received the approval from Toronto electors, which partially replaced Cabbagetown. In order to comprehend why Toronto ratepayers approved the project, we are considering the movement to implement the project (that had been recommended by the Curtis Report) as a social movement for affordable housing and utilizing the Resource Mobilization Approach (RMA) to analyse and evaluate the success and/or failure of the project. In this book, the authors want to challenge the widely held assumption that policy making in Canada was “an elite process primarily involving Cabinet ministers and senior civil servants” by bringing the citizens’ participation back in and highlighting their critical role in challenging the government’s housing policy and the building of Regent Park. This book has two parts: the first part examines the fate of the slum dwellers. Now that slums are gone, what happened to the poor working classes that used to live in these slums? The second part argues that when all the slums in the old city dissolve and are replaced by luxury condominiums and expensive gentrified homes, where will the recent immigrants go for accommodation? The recent information indicates that the majority of the low-income immigrants are seeking accommodations in the high-rise apartments of St. James Town or in the inner suburb communities in Scarborough, North York and Etobicocke. As these high-rise apartment buildings (mainly built in the 1980s and 1990s) age and deteriorate while overcrowding continues, there is a possibility that what happened in the late 19th century and the beginning of the 20th century will be repeated, causing the development of new slums. This alone should draw the attention of the municipal government and is one of the goals of the authors of this book. Chapter 7. Slums Must Go! And then what? Chapter 9. Where Did All the Poor Go? Audience: Major city mayors; policy advisers; NGOs interested in housing & community development; Academics and students in social and public policy; social work; urban sociology and the future of the cities.